Preparing and saving for your children’s education can be an overwhelming, and sometimes daunting, task. Most parents don’t even know where to begin and many think the best way to prepare for paying tuition expenses for their child in college is by simply stuffing money into a savings account. While this effort should be applauded, you are short-changing yourself and your child’s educational opportunities if this is all you are doing. 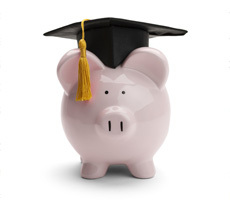 There are other options that not only offer a much better savings shelter for your child’s education, but also create wonderful opportunities to make your money work for you. If you are sure that your child will choose to attend an in-state college, the prepaid tuition plan is a great way to get an enormous break on tuition costs. The plan allows you to purchase credit hours at today’s cost for your child who will go to school years later. Hypothetically, you buy a full year of college now at a cost of $15,000 and by the time your child attends college, the cost is $25,000. You will receive that year of education at the current rate of $15,000. However, if your child decides to go out of state, you will get a refund of the prepaid tuition at the amount paid. You will not receive a discount for buying those credit hours at past-year rates. The 529 college savings plan has incredible tax advantages and is set up very similarly to an IRA. Within this plan, money is earned at a tax deferred rate. Once the child attends school, as long as the college savings plan funds are used towards his or her education, no taxes are ever paid on the money. Another great benefit of the 529 plan arises if your child decides not to attend college. In this case, the money can be placed in another child’s name allowing for the money to still be utilized for a college education. If the money is never used to pay for college education, taxes will be assessed on the earnings, and a penalty of 10% will be applied to any non-qualified distributions pursuant to Federal law. While this is not exactly a savings account, this is a tax credit that you can claim for four years while your child is in school to receive great tax rebates. The American Opportunity Credit offers a deduction of up to $2,500 for tuition and fees paid that year for your child. This money can be applied to help offset the costs of education for the next college year. The Abernathy Group is one of the most highly regarded and highly rated professional investment firms in the United States, located in the heart of Wall Street. We are dedicated to providing competent and sound investment advice to high net worth individuals and families. Additionally, through our assets under management, we strive to deliver solid returns, independent of the market, with less risk. This allows you and your family to sleep at night knowing your assets are invested intelligently with significantly less risk than alternatives available elsewhere. If you would like additional information about our firm, please email us at info@abbygroup.com , or give us a call at 888-4ABBYGR.